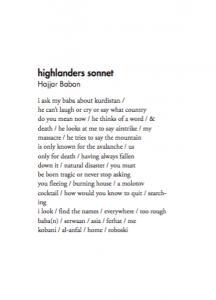 InsideOut’s 2017 Detroit Youth Poet Laureate, Hajjar Baban, is a Pakistani-born, Afghan-Kurdish poet who explores themes of identity, family and inheritance in her writing. 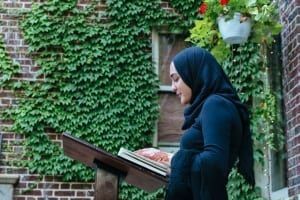 She was runner-up for the inaugural United States Youth Poet Laureate and was accepted into the prestigious First Wave Hip-Hop Arts Scholar at University of Wisconsin-Madison. The high school I attended didn’t have any creative writing classes and definitely didn’t have a creative space for students outside of Art. When I discovered InsideOut, I not only found a place where I could write and better my poetry, but it also sparked a passion in me for performance poetry. Most importantly, it gave me a space to talk about all the things I felt unsafe to discuss in my own community. The friends I made in InsideOut allowed me to grow and talk about things that may be affecting us outside of our small worlds–what was happening in the bigger world that our teachers at school didn’t consider factors in our physical and mental presence.